The Earth’s climate system is composed of a number of interacting components. The main driver is the sun whose energy is by far the main source of heat for Earth. The sun does not heat the Earth’s atmosphere directly but rather its energy passes through the atmosphere and heats the surface of Earth. The surface then heats the atmosphere from below. If the Earth did not lose heat to space, it would continue to heat up as energy is supplied from the sun. To maintain a fairly constant temperature the Earth must lose as much heat to space as it gains. Clouds, along with naturally occurring carbon dioxide in the atmosphere, prevent some of this heat from escaping and thus warm the Earth. Without these components in the atmosphere the temperature of the globe would be about 60°F colder than it is today. Besides blocking the loss of heat from Earth to outer space, clouds can also reflecting sunlight back to space. This reflected energy is unavailable to heat the Earth. All of the components of the climate system interact. For example, during ice ages, the growth of ice sheets is triggered by a reduction in the amount of energy reaching the Earth from the sun. As the ice sheets grow, forest and soil covered surfaces, which normally absorb (and therefore are warmed by) solar energy, are replaced by ice. Ice reflects most of the sun’s energy making it unavailable to warm the surface. Therefore the growth of the ice sheets contributes to further cooling of the planet. This is known as a positive feedback, since the cooling due to the reduction in solar energy is enhanced by the ice sheet. The same positive feedback results from global warming, as the extent of the ice sheets diminishes, more soil and potentially forest is exposed. These surfaces absorb more heat than the ice covered areas and hence the warming is enhanced. Natural fluctuations in the sun’s intensity. The amount of energy emitted by the sun is not constant. Changes in its intensity are typically small (a few tenths of a percent), but can influence temperatures on Earth if they occur over an extended period of time. Volcanic eruptions. Violent volcanic eruptions like Mt. Pinatubo in 1991 inject sulfur dioxide into the upper atmosphere. This compound is highly reflective to sunlight. Thus its presence in the upper atmosphere prevents a portion of the sun’s energy from reaching the Earth. Once in the upper atmosphere, these compounds can exist for several years following the eruption. Shorter-term cycles like El Nino. The oceans and atmosphere work together to influence climate. Natural oscillations in ocean currents, the location of the warmest or coldest ocean temperatures, etc. can influence atmospheric circulation patterns. El Nino is an example. In this case the pool of warm water that usually resides in the western tropical Pacific Ocean migrates east. This changes the atmospheric circulation pattern in the tropics which influences global weather patterns. Increase in greenhouse gases. Carbon dioxide and water vapor are both natural components of the Earth’s atmosphere. These gases, along with methane, nitrous oxide and ozone are termed greenhouse gases (GHGs) because of their ability of absorb some of the energy that the Earth emits to space and reradiate it back to the surface. Prior to industrialization, the Earth’s atmosphere contained about 280 parts per million of carbon dioxide (280 CO2 molecules for every 1,000,000 molecules in the atmosphere). This carbon dioxide was maintained in the atmosphere via volcanic and biological activity. ice cores. Direct measurements have been made since the mid 1950s and fit nicely with the ice core record. 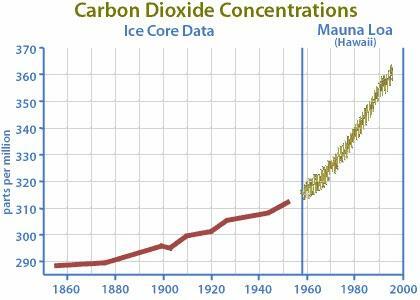 Carbon dioxide concentration was very constant prior to 1860. After 1900 the concentrations all increase exponentially. Fossil fuel burning releases about 6 billion tons of carbon each year into the atmosphere. Methane from agriculture, livestock, landfills and industry has increased by 133%. Nitrous oxide from agriculture and industry has increased by 15%. Changes in land use and land cover release 1 billion tons of carbon annually plus other gases. Land use changes include deforestation and urbanization. Deforestation influences the climate in two ways. 1) Trees are sinks for atmospheric carbon dioxide. They remove CO2 from the air and store it as vegetative matter. Fewer trees mean less CO2 is pulled from the atmosphere. If the trees are subsequently burned, the CO2 is added back to the atmosphere. 2) Removal of the trees changes the character of the land surface; this changes the amount of solar energy that is absorbed by the surface, evaporation, etc. Urbanization is similar to deforestation. Urban areas tend to absorb and hold more heat than vegetated surfaces. Thus cities are typically warmer than rural environments. When the concentration of greenhouse gases is increased (and everything else in the climate system, like the amount of clouds, is held constant) less of the Earth’s energy escapes to space. As a result the temperature of the Earth must rise. Temperature. Over the last 100 years, instrumental records indicate that the average temperature of the Earth has risen by nearly 1°F (0.5°C). The increases are most pronounced in polar regions of the Northern Hemisphere. In Alaska, temperatures have risen about 2.8°F (1.5°C) over the last century. Across the globe, the increase in temperature tends to be largest in winter, but still significant during the other seasons. Night time temperatures have risen faster than values observed during the day. U.S. temperatures have risen by 0.9°F over the past100 years. Within the past 25 years, U.S. temperatures increased 1.6°F. Precipitation. 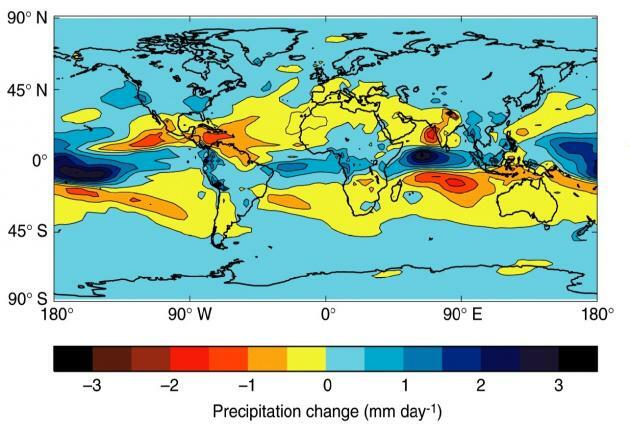 Although average precipitation across the globe has not changed dramatically, a change in the character of precipitation has been observed in many parts of the world. The observed trends suggest a shift from more frequent moderate rainfall events to more infrequent heavy rainfall events. Since the period of time between rainfall events increases, drought may become more prevalent. But since the rain events that do occur can be quite heavy, the increased risk of flooding is also a concern. Clearly this change in the character of precipitation has implications for water resource and irrigation decisions. CO2 Levels. In order to project future climate conditions, scientists must predict what the world will look like politically, economically and environmentally in 100 years. Given the uncertainty in such predictions, scientists have developed a range of scenarios of future greenhouse gas emissions. These range from a fossil-fuel intense society that undergoes rapid economic growth and experiences a modest increase in population. In this case atmospheric CO2levels increase to four times their pre-industrial values by 2100. 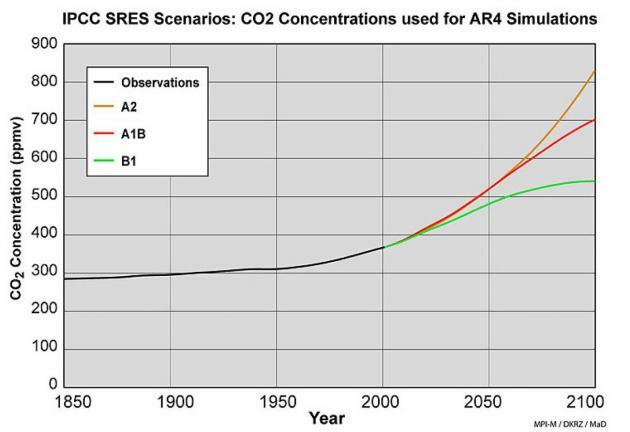 A business-as-usual scenario…continuing the present trend in greenhouse gas emissions … leads to a similar increase in CO2 levels by 2100 (A2 in the figure below). More environmentally-friendly scenarios, with reductions in fossil fuel usage, also lead to increases in atmospheric CO2 concentration. This results from the lifetime of CO2 in the atmosphere (about 100 years). Thus today’s CO2 emissions are not removed from the atmosphere until 2106. Even the most environmentally friendly emission scenarios lead to an increase in atmospheric CO2 concentration over the next 100 years, to about double preindustrial levels (B1 in previous figure). Temperature. Many climate models exist. They all rely on the same physics, but differ in the ways in which variables like clouds are parameterized. The “art” of climate modeling is how processes that can not be well represented by the physics of the models are accounted for. 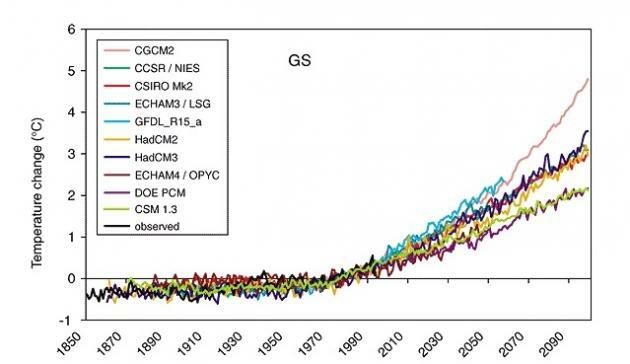 All models experience the same increase in greenhouse gas concentration. They all show a warming by 2100. The only difference is the magnitude of the warming. Here model warming estimates range from 1.5 to 5.0°C by 2100.
expect to see a 2-3 degree change over 100 years! Over the last century the concentration of greenhouse gases in the Earth’s atmosphere has increased markedly. CO2 levels in the atmosphere have not been this high for hundreds of thousands of years. In isolation this change must result in a warming of the Earth’s temperature. 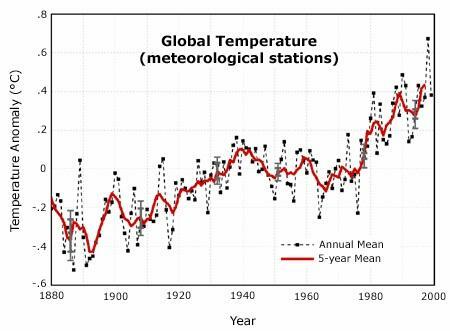 Over this same time period climate observations indicate that the global temperature has increased by about 1°F. Although changes in average precipitation have been small (on the order of 1-2%), rain gauge records show that the character of precipitation events has changed. Heavy rainfall events have become more frequent over the last half century. It is unlikely that the emission of carbon dioxide into the Earth’s atmosphere will slow in the near future. In fact, most projections indicate increased carbon dioxide emissions into the middle to late part of the 21st century. This continued increase will likely lead to additional increases in temperature, with most models projecting rises of between 1.5 and 5°C. Although the exact magnitude of changes in precipitation are uncertain, there is reason to believe that precipitation events will become more variable, leading to increases in both the frequency of floods and droughts.